March wrap up and Q1 too! It’s hard to believe, kittens, but another month has come and gone. Time for the yardage post! I’ve been wondering how much longer I can keep up this pace. It’s awesome, but I know it won’t last forever. Eventually, I’m going to hit a slump. I didn’t do too bad in Q1, not as well as I would have liked, mind you. Toward the end, I made a few purchases and I didn’t get a chance to use up the yarn before it was up. Overall, there was a reduction and for that, I’m glad. For Q2, I’m aiming for no-yardage-in. This shouldn’t be too hard, as there are no gift-giving holidays in the next three months and I’m busy preparing for an 1,100 mile move sometime during Q3. (Oh my, I haven’t even blogged that, have I? I hinted at it and being stressed out and busy, but never came out and said why it was.) It’s easy to stay motivated not to buy when I’m focused on fitting everything into my single tote and I’m rather close. I’ll need a couple more 2,000yd+ months to make it happen, though. As I update each quarter, I think I’ll do a running tally for the year as well. The math geek in me loves this. Yeah…last week’s WIP it post never happened thanks to a rota virus that swept through our house over the weekend. 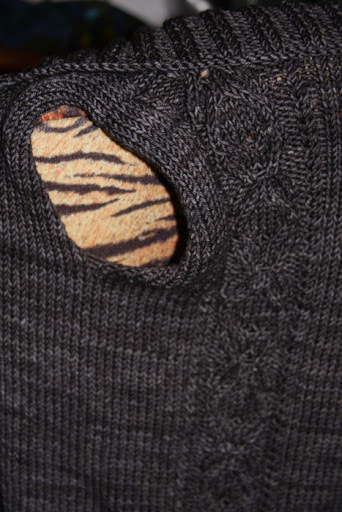 Other then my sweater, there wasn’t really anything to show or blog anyway, so not a huge loss in the end. So let’s get to the WIPs, shall we? Ah, the ugly socks. There hasn’t been a lot of progress made on these since they were last blogged. 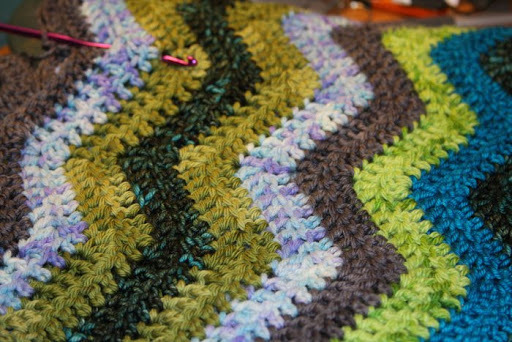 I’ve knit about 6 rows–two at a time for 12 total rounds–since. I’m not in love with them and other sock patterns keep sweetly singing to me. I want to finish these first and I can in relatively short order, if I just focus and DO them rather then thinking about other knits I’d rather be working on. Starting last night, I now have a goal of knitting on them for at least an hour every night until they’re finished. I’m not sure if I can stick to that, but if I can, I should have socks in the next two weeks. I know a lot of other knitters love self-patterning yarn: I am not one of them. 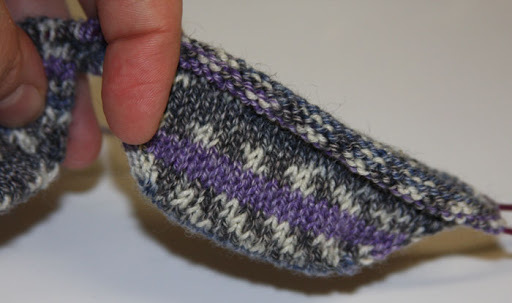 It makes me a bit sad because some of the most robust sock yarns happen to be self-patterning. Thus is life, I suppose. And my Heather Hoodie Vest. I am so close to finishing this one, but after being knocked on my back for two days, it has been hard to get back into and finish. (It’s been hard to get back into knitting, period.) I could not get a decent photo of this one, so the peek of the sleeve and collar will have to do. This was the best representation of the color I could get with the best definition of the cable. It just pops out in person, but in photos it may as well not be there. As usual, there are heavy modifications I’ve made to the pattern. I’ve shortened the body, made it knit all in one piece rather then seamed, swapped the hood out for a collar, and am widening the button bands on the front. I’m still debating what I want to do about the sleeves; I suspect they will be slightly lengthened. I am not a fan of cap sleeves. There it is kittens: what I’ve worked on this last week barring lots of stress and sickness. I hope to do some better, less rambly and unfocused posts soon! Too tired tonight and no pictures. It’s been a hectic week for us, so expect a late WIP post this week. Later, Kittens! Man, that was a fast week, Kittens! The red violet sweater shown in my last WIP it post was binned last night. The sweater kept pilling and felting as I was working on it–so annoying. Malabrigo never likes to be ripped and trying to work with it after it has been is a gamble. I knew this and I’m not upset by it. I have accepted that at the gauge I was knitting it up in, it would just be worse and never survive more then a few wears. Mostly it was a project to cleanse my knitting palette and clear my mind after the Ravelympics. It served its purpose and now I’m moving on. This is the last WIP photo of this blanket! The last stitch was cast off last night and I’m currently figuring out how to block it. I hope to have that finished by the weekend and early next week, I’m putting this beast in the mail. (Insured and with tracking, I assure you!) Weaving in all the tails may kill me. 1 per row. OUCH. (That’s 2 per color stripe.) Hold me, Kittens, this could get ugly. » There had been a question asked about the pattern to this blanket if there is one. And the answer is yes, I did have a plan going in. I’ve been alternating between sets of [gray, green, blue, teal, blue, green] and [gray, blue, green, teal, green, blue] the entire time. 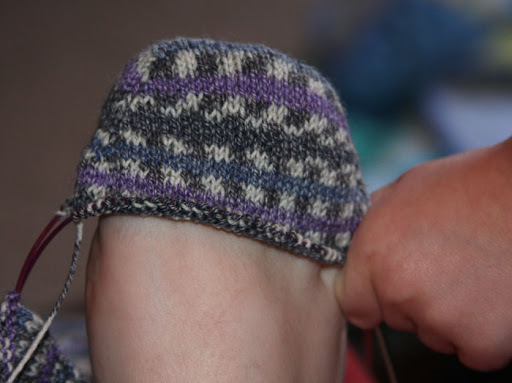 Next, I cast on some socks because the mood has finally struck again. Let’s face it, I’m rather short on them these days. Admittedly, this is my least favorite sock yarn (it was a gift, I feel awful for admitting that I’m not smitten with it), but the patterning is tolerable and this blend of yarn wears well. So it’s all good. 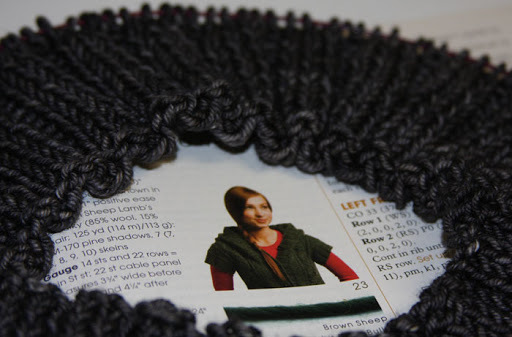 Lastly, this morning I cast on the Heather Hoodie from Knitscene in my Squoosh MCN Worsted. I’m knitting all in one piece rather then having to do all of the seaming. I’m about to figure out where to place my cables while watching Project Runway. 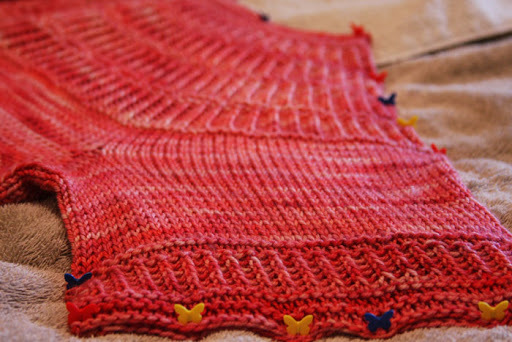 Already, this is looking to be a very quick knit and may be done by the end of the month. If so, 4 of 12 will be out of the way. I’m still aiming for 14 sweaters this year–#15 just went into the waste bin–but 12 is the official number for IntSweMoDo. I’m so excited that I’ve had such amazing start to the year! I’m averaging a sweater every 3 weeks. It’s been a crazy busy week full of yarny goodness. Until the next post! No time for chatter today. Marathon crocheting going on here as well as putzing around with a bottom-up cardigan from some reclaimed Malabrigo. No pattern, more free form and by-the-seat-of-my-pants. It’s how I roll. The Olympian Cardigan needs the buttons sewn on and a few more ends woven in. Leave it to Texas and the weird weather we’ve been having that it would be rainy for a few days and slow down the blocking process. Good morning, Kittens! Welcome to March. Mine is starting with my Olympian Cardi blocking on my bed. For those concerned with how much sleep I’ve been getting, I can assure you all that I slept about 9 hours last night. I’m on my way to recovery from sleep deprivation. Next Ravelympics, I’m not dividing myself between two projects. That was stupidity on my part. This month, I think the focus is going to be the afghan and I have plans for some frogged Malabrigo. I have been working on the yarn that is outside of my tote and already wound before turning my focus into the tote. My next few projects will be from reclaimed yarns before I move onto others. So you should be seeing from me…a Malabrigo sweater, an FSM sweater, and a pair of socks from some Shibui I’ve had caked and ready to go for more then 6 months now. March should be productive and busy. Kittens, look at this yardage. 2010 is kicking some serious fanny in plowing through yardage! That kind of yardage will never happen again. Little sleep and being propped up by caffeine is insane. 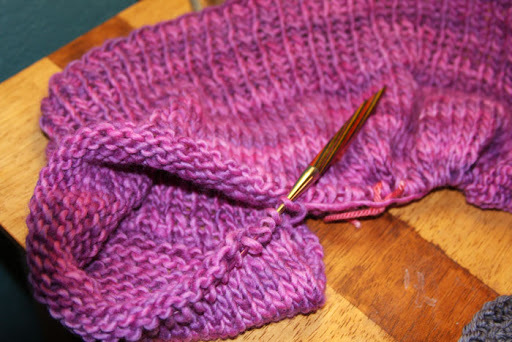 In the first two months of ’10, I have knit more then a quarter of my total yardage for 2009. 31% of it, to be exact.